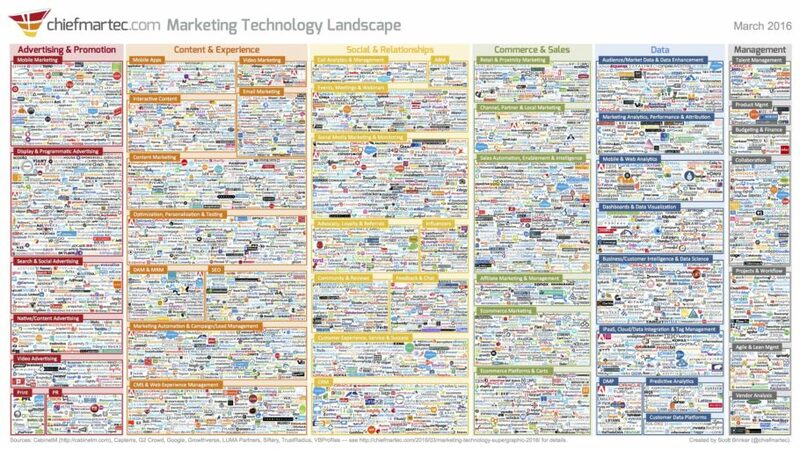 Each year Scott Brinker releases his famous Marketing Technology Landscape Supergraphic as shown below. There are close to two thousand companies on that chart, which is representative of what’s changing in marketing. I’m a CMO of a tech company, and I look at that chart and it makes me want to gasp. I’ve been in the technology business for 20 years, and I’m the CMO of a technology company. Think of all the CMOs of non-technology companies looking at that and saying, “What do I do? Oh my gosh.” The state of how the Internet and tech companies are changing the marketing landscape is unparalleled. The pace of innovation in marketing technology is at an all-time high. Gone are the days of the mad men. Enter the new tech-savvy CMO. The awesome thing about digital marketing that appeared in the first decade of the 2000s was everything became trackable. I had a website. I could track what was happening on my website. I had an e-commerce store. I could track everything that happened on my e-commerce store. I could place ads on the Internet. I could track exactly what was happening with those ads, who clicked through those ads, and who purchased. That was never possible before. I’m really excited about the technology landscape in marketing. I’m excited about how technology is producing innovation at a pace we’ve never seen before in marketing. Because it’s my craft, I get excited about the company we’re building and the impact we’re having on the economy and businesses around the world, but I also get excited about the tech changes in marketing and the advancements in the craft of marketing that are happening all because of the Internet. This interview was conducted in late 2015. There were about 2,000 companies on the graphic that year. In 2016 there are 3,874, and Scott himself admits he’s probably missing a few, so let’s round up and say there are 4,000. That means the number of marketing tech–not just tech companies, but marketing tech companies–that CMOs have to keep up with has doubled in the past year, and not from a small number to begin with. Clearly, it’s impossible to keep track of every marketing technology out there, and yet CMOs have to keep up somehow, otherwise they could see their performance lag and the competition get ahead because they’re using something other CMOs aren’t even aware of. What’s a CMO to do? That’s a good question, and I’m not giving answers so much as I’m soliciting them, because I’m working on a piece for CMO.com on this topic. Give me your answers in the comments below and you might see yourself quoted alongside other CMOs from my book.